Parent Assisted Immersive Reading (P.A.I.R.) is an at-home read-aloud program that accelerates reading readiness in young children. It is designed for use with students in their first year of formal schooling. Its benefits are dramatic, broad-ranging and long-lasting. The program involves parents regularly reading aloud to their child while at the same time engaging them in meaningful conversation about the book. P.A.I.R. storybooks are specifically designed for this purpose. They come with vital prompts, tips and questions that allow parents to effectively enrich each reading session. P.A.I.R. books capture a child’s interest from the start. Illustrations are bold and colourful, the stories wholesome and adventurous. 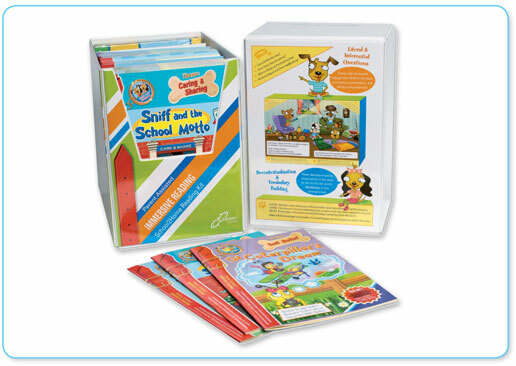 Promotes a love of reading and a positive attitude to school and learning. Empowers parents by teaching them a potent way to engage their child in reading. At the beginning of week 1 of the term program (we recommend starting in Term 2, 3 or 4), the teacher distributes one book to each child in their Foundation/Kindergarten class. Each student takes the book and guide home in their P.A.I.R. satchel (provided in the kit) and gives them to their parents or carers. It is the responsibility of the parent or carer to read the book aloud to the child. The books are returned to school in the satchel at the end of the week. In week 2, another book from the P.A.I.R. series is given to each child to take home. P.A.I.R. is based on a wealth of local and international research. Its purpose and structure is underpinned by the work of some of the world’s leading educators. P.A.I.R. is designed to help parents make their child ‘reading-ready’. Put simply – If parents read aloud to their child regularly during the early years they can lift their child’s reading skills significantly, now and for the future. Children read to more frequently at age 4–5 achieved higher scores on the National Assessment Program – Literacy and Numeracy (NAPLAN tests) for both Reading and Numeracy in Year 3 (age 8 to 9). Copyright © 2005~2019 Teachers 4 Teachers.| ABN: 55 116 367 410 | All Rights Reserved.